The Chosen - Printer Friendly Page - On the Run - Theatre Port Houston - Theatre Auditions News and more! Evelyn Rubenstein JCC of Houston and Theater LaB Houston co-present the regional premiere of The Chosen adapted by Aaron Posner and Chaim Potok from the novel by Chaim Potok May 11-21, 2017 at the J’s Kaplan Theatre. This award-winning adaptation is about a complicated friendship between two Jewish boys, two fathers and two very different Jewish communities in 1940s Brooklyn. The main characters are first and second-generation Jewish immigrants living in New York at the end of World War II. They all view America as a land of hope, where they can enjoy religious, economic and educational freedom. But danger and conflict lurk when their individuality and tradition is lost in the vastness of American life. The boys learn important lessons about themselves on the path to understanding and reconciliation. 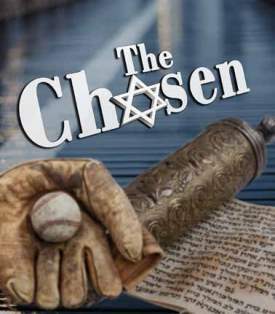 The Chosen was made into a successful film in 1981, directed by Jeremy Kagan and starred Robbie Benson, Barry Miller, Rod Steiger and Maximilian Schell. In January 2015, Theater LaB Houston staged the sold-out, critically acclaimed production of My Name is Asher Lev, also adapted by Aaron Posner and based on the novel by Chaim Potok. Resident director at TLH, Linda Phenix directs the play. A Houston-based ensemble of actors include Brad Goertz, Steve Garfinkel, Trevor B. Cone, Brian Chambers and John Forgy. The Chosen will be performed at the Kaplan Theatre at Evelyn Rubenstein JCC.